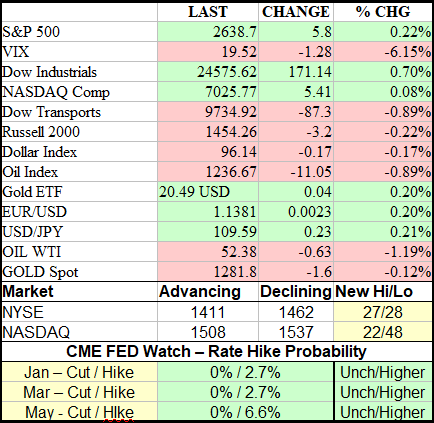 The equity market tried to rebound from Tuesday losses but gains didn't hold. The good news is that support is still present. Price action was very indecisive but no wonder, there is a lot for investors to think about and no end in sight for many of the market's woes. Earnings are coming in at a decent clip and better than expected but the cautionary tone from Davos and uncertainty on trade has people on edge. Today's Davos headline(s) come from Jamie Dimon. He says the US economy is doing well and on course to do keep doing well. He also says there are obstacles (trade, Brexit, shutdown) that could slow or alter the economy if they are not overcome. The salient point I think is that the economy is doing well and on track to do well. The obstacles are there, yes, but when are there not obstacles for the market to overcome? On the trade front, reports that the White House had canceled preparatory meetings scheduled ahead of next week's higher-level trade meeting have been all but forgotten. Kudlow's message that there was no meeting scheduled, no meeting canceled, was enough to sooth the restless beast. The general consensus is some progress will be made at the trade-meeting next week, at least enough to allow another meeting and postponement of threatened tariffs. 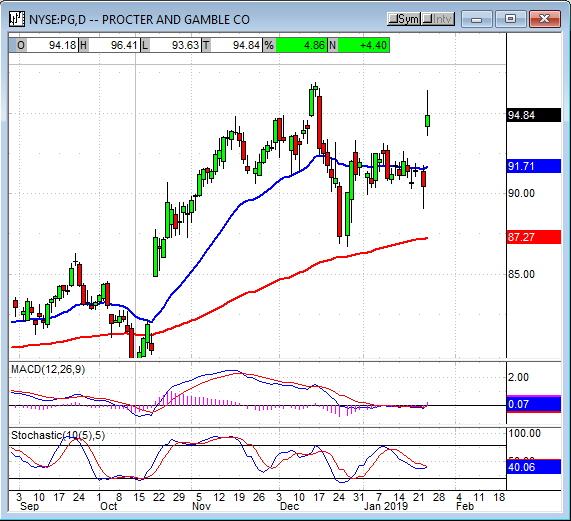 In earnings news, UTX and Proctor & Gamble were among the top movers in the early session. Both reported before the bell and both delivered better than expected results and guidance. While the two have little in common they both report strong or solid sales growth in key units and expect that trend to continue. It is important to note that PG's results were boosted by higher prices and show successful pass-through of cost to the consumer. 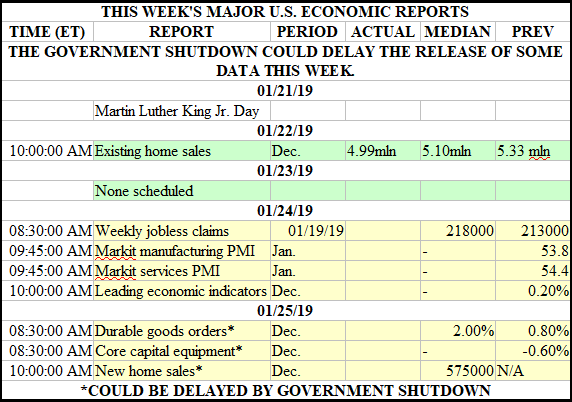 There was no economic data today and there is very little due out this week. Tomorrow is going to be the big day because everything scheduled for Friday won't come out, government shutdown. The shutdown rages on and still no sign of a solution. Trump said today he will deliver a State of the Union Address despite Pelosi's request otherwise. Pelosi later responded that the House wouldn't allow the State of the Union until the government is reopened. The two are now locked in battle, hopefully, it won't blow up in all of our faces. Another central bank cycle is at hand, today's policy statement comes from the BOJ. The BOJ kept policy unchanged, lowered their inflation targets, and cited growing risks to the global economy. 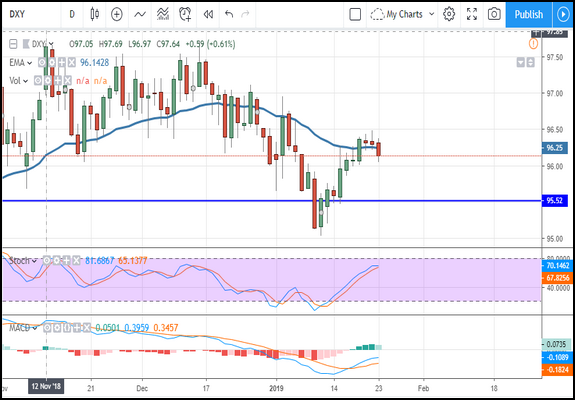 The news had the yen trading lower versus the dollar although the generally weaker outlook for global growth, trade, and political uncertainty had it down against just about everything else. 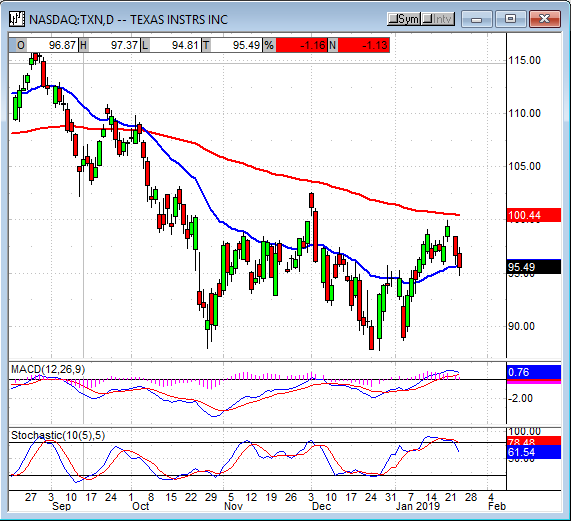 The index fell below the short-term moving average in today's session and may move lower. The risk is in tomorrow's ECB meeting, a meeting that could send the dollar back to retest the recent highs if Draghi and crew turn dovish like the rest of the worlds central bankers. Gold moved sideways in today's session as traders wait on tomorrow's ECB meeting. The meeting isn't expected to bring a change in policy but it could bring a change in outlook that could keep the EUR, the USD, and gold moving sideways over the next week or more. 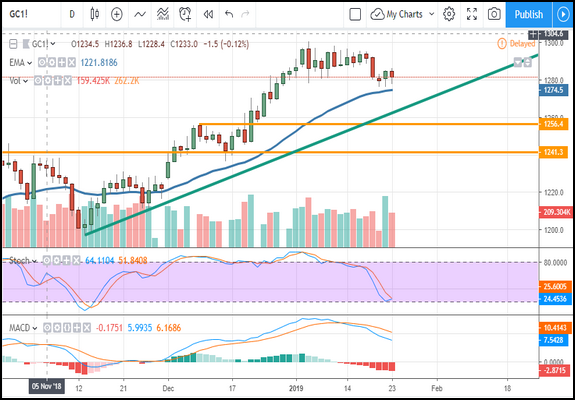 Today's action shows support is still present at the short-term moving average, near $1,275, where it is possible a bounce may form. A move higher may take the metal up to retest the $1,300 level, a move lower may find support at my near-term trend line. 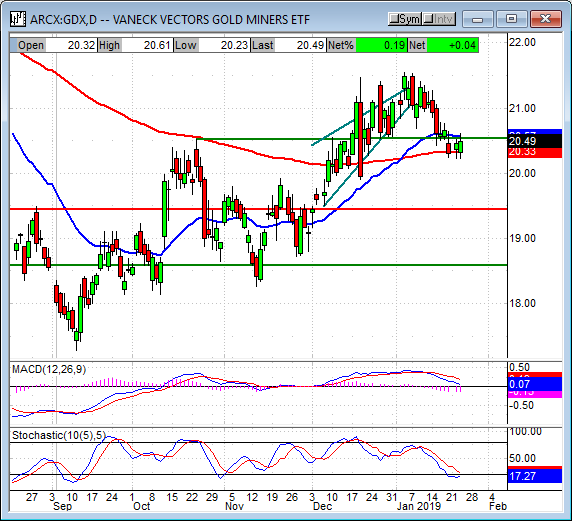 The Gold Miners ETF GDX moved sideways in today's action and is sitting on support at the long-term moving average. The ETF appears to be setting up for another push higher but that is dependent on gold prices, the dollar, and geopolitics. The indicators are consistent with consolidation and test of support so, while the ETF is above the 150-day EMA, I am cautiously bullish for this sector. A fall below the moving would negate that outlook and could happen as soon as tomorrow if the ECB meeting is substantially more dovish than what I expect. Oil prices continue to trend sideways near the $52.50 level. Today's action was light, weak, and within a tight range that produced a small spinning top candle. The market looks like it wants to move higher, perhaps because it believes OPEC can tighten the market again, but the slowdown in global economic activity and continuously rising US output won't let it. Sooner or later the outlook will change or US output will top-out but until it does I think there is more risk to the downside than up. 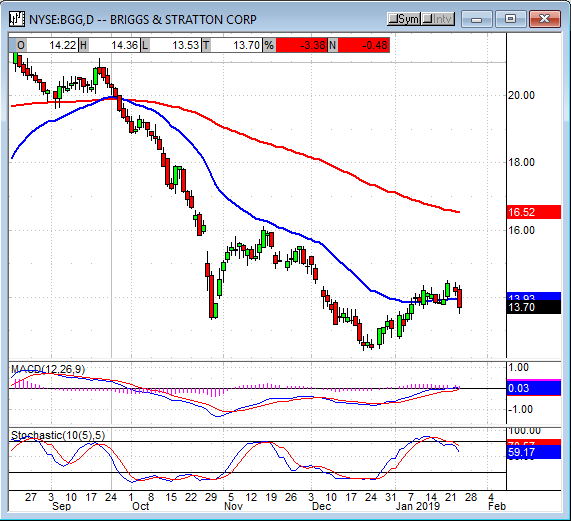 A move below the short-term moving average could retest the long-term low below $44. 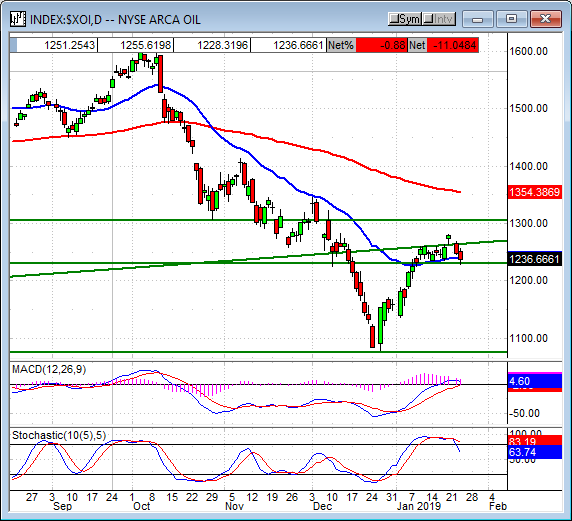 The Oil Index moved lower in today's session and is testing for support at the short-term moving average. The index is poised to move lower and may do so considering the outlook for earnings this year is the worst of all 11 S&P 500 sectors. The energy sector, due to low oil prices and slowing global growth, is expected to see EPS decline and that is a heavy burden for it to bear. If oil prices fall again the sector could fall hard too. 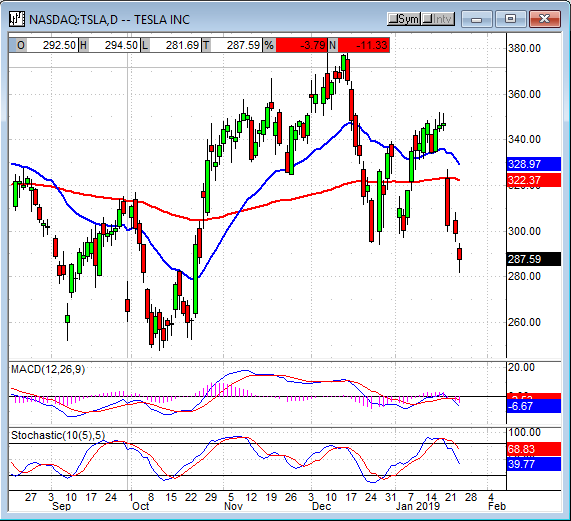 A move below the 30-day EMA would be bearish and may lead to a retest of the 1,100 level. Tesla got a downgrade from RBC that tips the scales in favor of the bears. Now that RBC is recommending an underweight holding there are more bears among the sell-side analysts than bulls. The downgrade is due to valuation lofty expectations the company has yet to meet. Goldman Sachs issues a similar warning and downgrade yesterday. In company news, Tesla slashed its workforce in what it says are moves made for efficiency and continuing improvements. We can only assume these cuts will aid the company its quest for profitability. Many of the cuts were in non-essential areas like sales and delivery but there were cuts in the production staff as well. Shares fell -4.0% and could retest $260 in the near future. Texas Instruments was among a number of tech companies to report after the bell. The company reported a mixed quarter that included a slight miss on revenue and a slight beat on the EPS end. Sales were weaker than the headlines show, a surprise widening of the gross margin offset the revenue miss to aid EPS. Forward guidance was also a bit on the weak side but investors didn't care, the company is yielding over 3.0% at current prices and able to cover its payment. Shares were up 0.50% in after-hours trading. 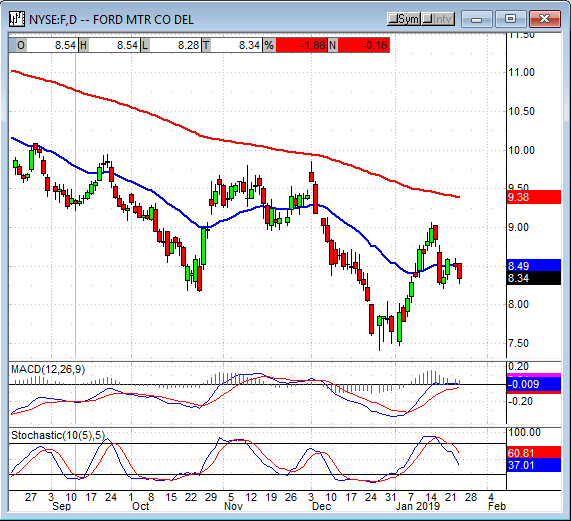 Ford reported a mixed quarter that resulted in a slight beat on the top line and a slight miss on the bottom. The company reports that sales in the US were strong but offset by losses in the EU, Latin America, and China. Mix and product pricing was favorable in the US as consumers move away from sedans into the SUV/Crossover category. Shares of the stock were up about 0.60% in after-hours trading. Briggs & Stratton is another to report a mixed quarter and have investors shrug it off. The icon of small engines grew revenue a surprising 13.2% beating estimates by a substantial margin. EPS fell short on both a GAAP and non-GAAP basis but that shortfall was offset by the outlook. The company makes note of favorable momentum in sales of small engines and parts for commercial markets that is expected to continue. The news that really got the market's attention, however, was the revised guidance. Guidance was lowered to a range of $1.10 to $1.30 from $1.40 to $1.60, a big change, but not as much as some had feared the Sears bankruptcy would bring. Shares were up 1.5% in after-hours trading. 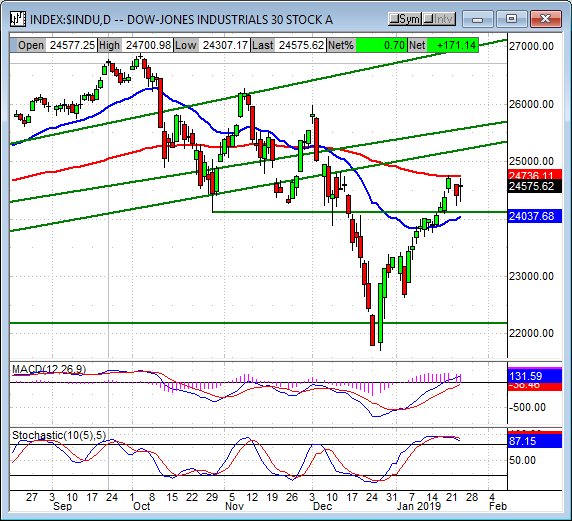 Today's index was up, it was down, it was sideways but in all cases, it shows support is still present. 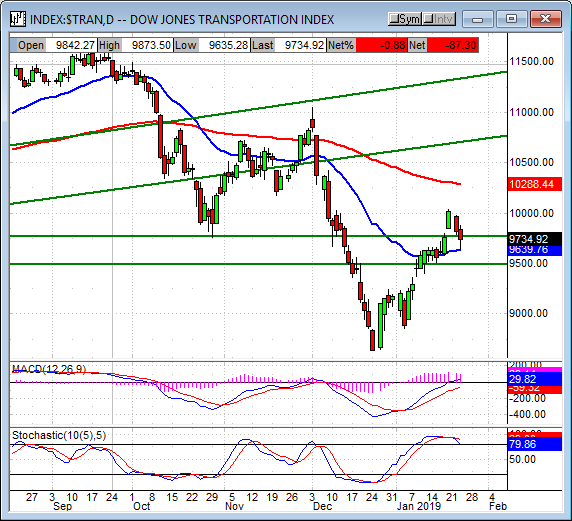 The worst looking chart, the Dow Jones Transportation Average, shed -1.0% but even it shows the market is still supported. The candle is medium sized and red but the wick shows prices bounced off of the short-term moving average. The bounce was not strong but prices were able to hold the rebound into the close and momentum is bullish. Earnings are the key to the rally, so long as those continue to be good and the outlook for 2019 holds up the rally should be able to regain its footing. A move up would be bullish, my targets are 10,000 and then 10,280 if the index closes above 9,750. 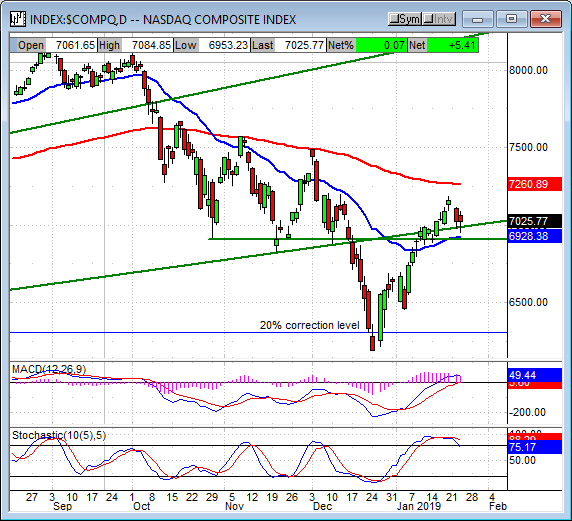 The NASDAQ Composite also posted a loss but only about -0.10%. The tech-heavy index moved down in today's session to retest support at 7,000 and the short-term moving average where support is confirmed. This level of support is also consistent with a major, long-term trend line so it could produce a strong bounce with the right catalyst. The indicators are consistent with consolidation and potential for prices to fall so caution is still warranted. 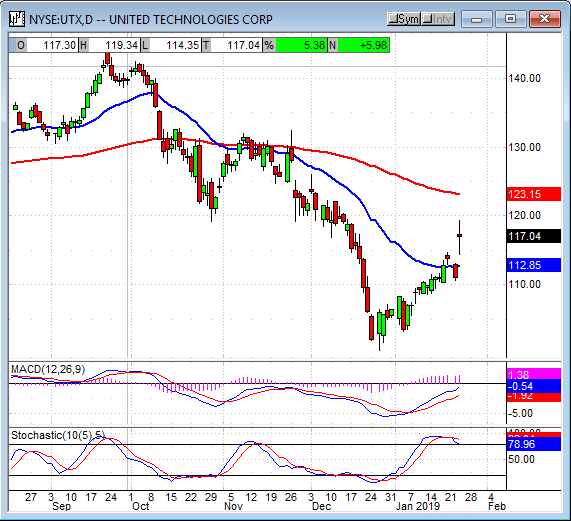 A move up from this level would be bullish and may test resistance at the long-term moving average. 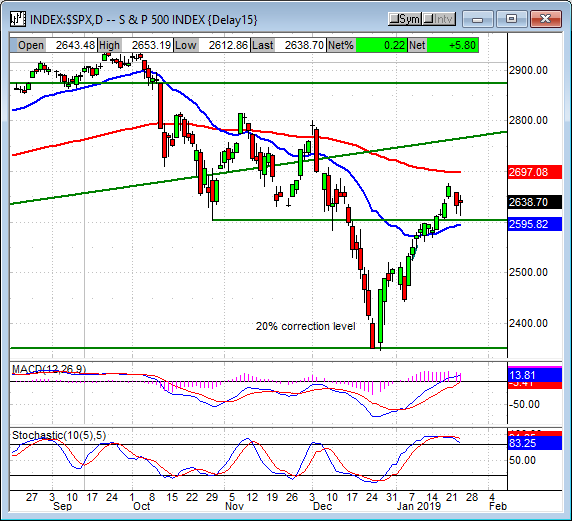 The S&P 500 closed with a gain near 0.10% and created a small doji-like candle for today's session. The candle shows some uncertainty but also that support is present at the baseline of the Vee Bottom I talked about last week. So long as this support holds I am very optimistic a move higher will come, likely driven by earnings and possibly by trade news, an end to the shutdown, etc. 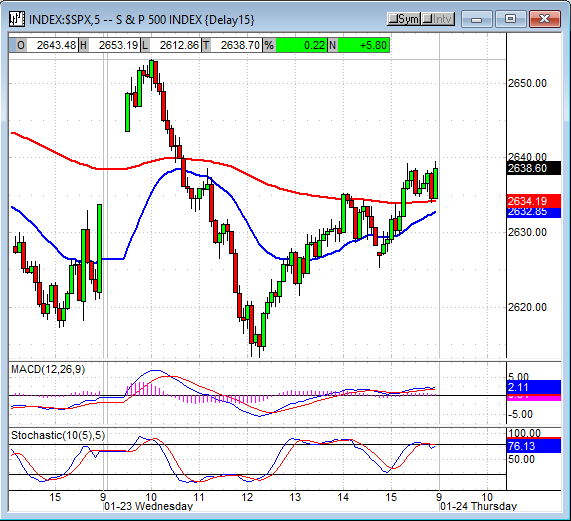 Support is just above 2,600 and the short-term moving average, a break below which would be bearish. A move higher is likely to reach 2,700 in the very near-term and 2,775/2,800 in the near to short-term. The Dow Jones Industrial Average closed with a gain of 0.70% after moving within a slightly wider range than its fellows. The blue-chip index created a medium sized doji candle sitting between the support of the short-term moving average and long-term moving average. The index is at a make-or-break moment where the long-term money gets back in the market or resumes selling so the next few trading days could be crucial. 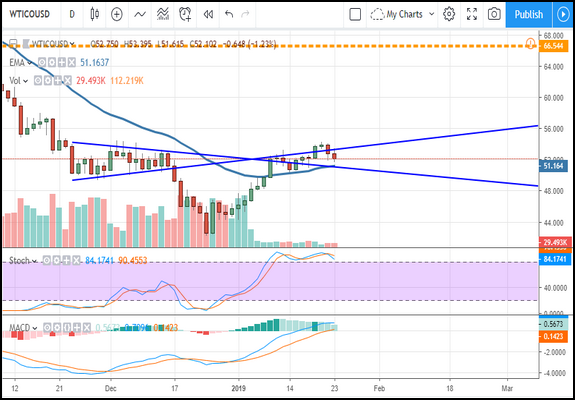 A move higher may find resistance at 24,735 and then near 25,500, a move lower may find support at 24,000 and the short-term moving average, a break of which would cancel the Vee Bottom reversal. The market is indeed at a make-or-break moment; it has to decide if it is going to believe earnings and outlook for earnings or if it's going to succumb to fear. The fears are not misplaced, there is some risk on all fronts, but so far the global recession is at still at bay. The fears could become reality if the trade talks break down and tariffs burdens are intensified, until then I am cautiously optimistic they won't. Based on earnings, the reality that drives the market, the outlook is positive so I remain bullish for the long-term. Because there is still so much risk and fear in the market I am very cautiously bullish, at least until the next round of trade talks. Quick note. My wife is due to deliver our second baby any day now. If there is no wrap on Thursday that is why. If there is no baby by Monday then we're going to induce so Monday's wrap may be brief.